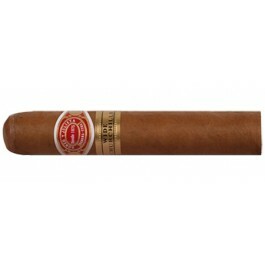 The Romeo y Julieta Wide Churchills is a smooth, with 55 ring gauge, 5.1” (130mm) long and comes in a box of 25 cigars. It is one of the latest additions by Habanos S.A. to the Romeo y Julieta brand. After the Short Churchill was released with great success in 2006, Romeo and Julieta modelled all their newer vitolas after this awesome cigar. This is why the Wide Churchill is slightly longer and somewhat wider than the Robusto sized Short Churchills. The cigars are packed full of smooth, subtle, medium flavored aromas. Launched in 2010.